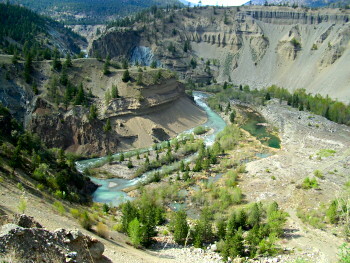 Plunked in between the lush Vancouver Coast and Mountains and the arid Cariboo Chilcotin the Upper Bridge River Valley offers a perfect balance of weather and terrain. Situated 100km north of Pemberton and 100km west of Lillooet, Tyaughton Lake is what some would call "the end of the road"! In fact it is the end of the highway maintained road and the beginning of the road to your ultimate adventure. You'll wake up in the morning to the lake so smooth it looks like glass, it beckons you to hop in the canoe and go for a peaceful paddle. Maybe, you want to sit back and enjoy the deluxe comfort of one of our gorgeous chalets with the lake a stones throw away for those who love to canoe, fish, swim or watch the wildlife float by. 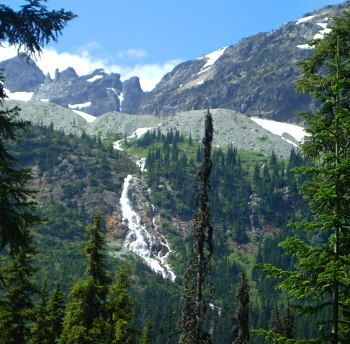 From Vancouver, follow either the highway #1 up to Lytton, then travel highway 12 to Lillooet. From Lillooet, follow highway 40 ( carpenter lake road) until you find our blue and white tourism signs, with arrows marking your way to Tyaughton Lake and our Chalets. You may choose to follow the sea to sky through Squamish and Whistler. Carry on towards Pemberton taking the Duffy Lake Road to Lillooet, then highway 40 to our turn off. In the summer months, between the end of May and the end of October, the Hurly River Forestry road is an option, but, 4 wheel drive is recommended, as it can be a bumpy ride. You'll find the Hurly to be a shorter route into our area, via the town of Pemberton (north of Whistler) following the road through Pemberton Meadows. Always, check in with us for updates on the conditions of all the routes!! Spring, summer and fall, the opportunities for outdoor recreation are unlimited! Sparkling winters, crisp fresh mountain air. The season is exhilarating . . . and so is the fun!